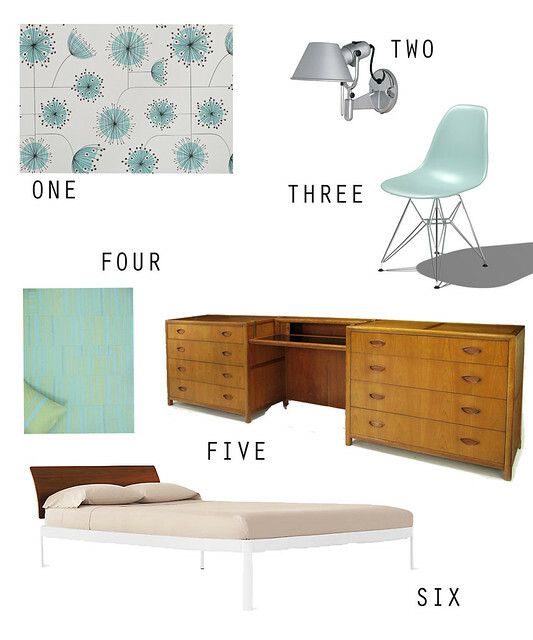 for our bedroom I had a vision of a crisp, clean space that felt bright and airy. but after reading your wallpaper comments, I hesitated, and was pulled in to the idea of a cozy refuge from the rest of the house. I've come around again though, and am back to embracing the nature of our house - large bright open spaces and going with my original plan. d has hardwired two lovely tolomeo wall lights on each side of the bed (bought years ago at an artemide parking lot sale), and we are taking advantage of the dwr bedroom sale to order our new bed. (any advice on mattresses?) the desk, bedding, and chair are already all in place. this lounge chair is on the wish list for the patio off the bedroom. It will be beautiful! I'd recommend a latex mattress, have been really happy with ours. Doesn't get hot and you don't need to turn it.